Congratulations to the 2015 U.S. 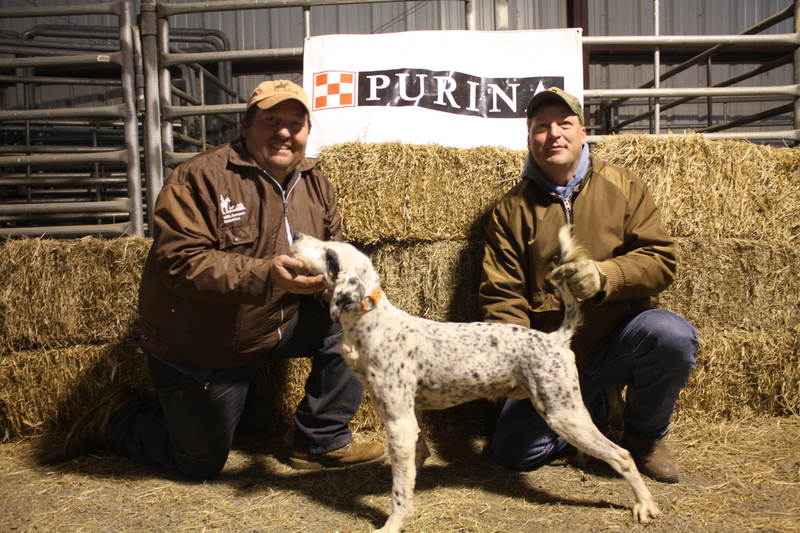 Shooting Dog Invitational Championship winner: C S Pressure Test, handled by Doug Ray and owned by Tony and Becky Gibson of Union Springs, AL. Team C S Pressure Test and Doug Ray! Before the winner announcement….all is quite and serious…. And after the announcement….big congrats all around. Margie Ricci gives Doug a big hug! ….a congratulatory handshake from George Tracy…. ….and a pound on the back from Matt Basilone! A hard battle in severe conditions. Well done, Jake and Doug. Conecuh’s Pressure Test, a handsome English setter owned by Becky and Tony Gibson of Union Springs, Alabama recently took top honors at the prestigious US Shooting Dog Invitational. The trial is held each year in February on the Camp Robinson Field Trial Grounds near Conway, Arkansas. Doug Ray, pro trainer from Waynesville, Georgia handled “Jake” to this esteemed title. The trial is set up for the top 12 dogs in the United States; owners and trainers throughout the states desire to be invited to “play”. Jake’s credentials to get to this point were the runner-up titles at the Masters and the All-American Open Shooting Dog Championships and placement in the Tail Feathers Open Shooting Dog Classic. Jake, white, black, tan and ticked, was whelped January 16, 2009 and raised at Buddy Smith’s kennel. A son of Hytest Sky Hawk and Luminary’s Snow Bell, he was spotted and acquired by Becky and Tony Gibson in his derby year. 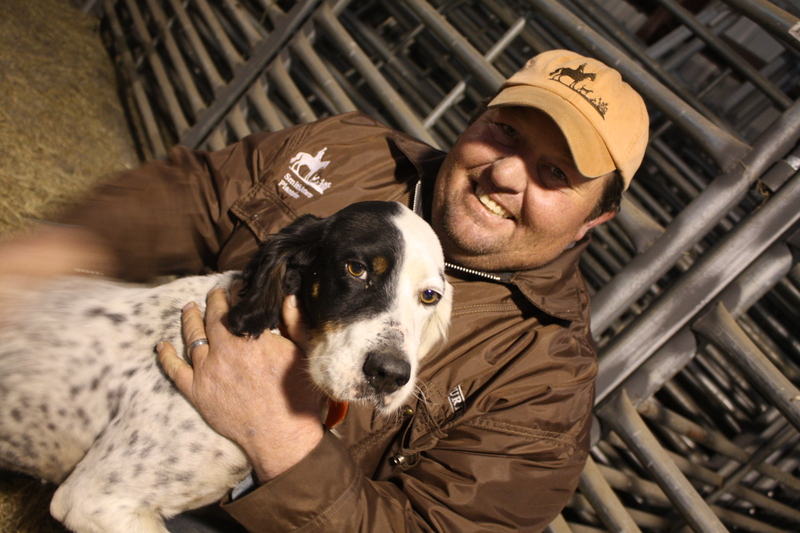 Tony ran him as a derby and first year shooting dog; then placed him with Doug Ray. Ray continued Jake’s development and has had admirable success with his training program. A beautiful dog on the ground and with style and manners, Jake had 4 quality finds on the first afternoon. Sunday morning, he appropriately backed his bracemate three times, had a proper stop to flight and a good find in his own right, all with a strong ground race. 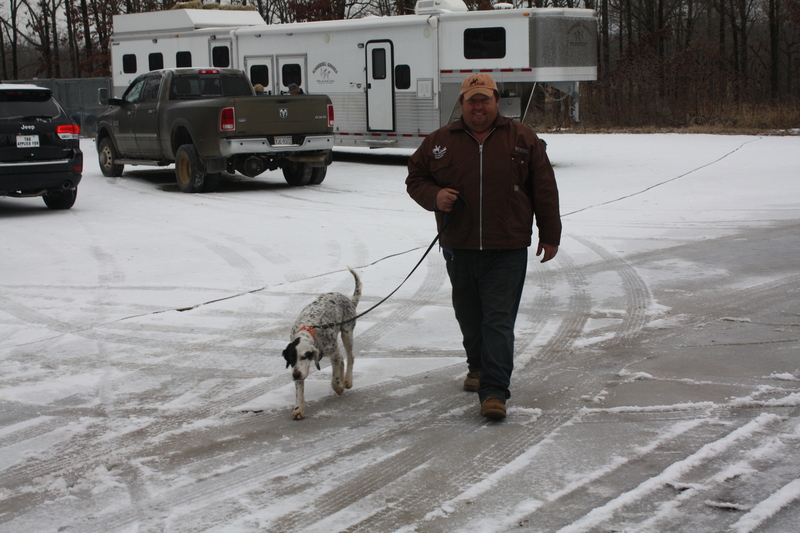 Not’ta Snow Balls Chance, pointer male handled by Stacy Perkins and owned by Rex Garner of Pittsburg, Kansas. “Tim” was the 2014 champion; therefore automatically qualified. 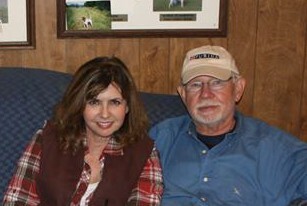 Perkins was accompanied to Arkansas by his tophand and wife, Angela. Garner came and brought along his faithful Kansas Killers, Mike Deplue and Bill Cignetti. Great River Ice, pointer male handled by Mike Tracy and owned by Great River Kennels/the Sanchez family of Central Islip, New York. Patriarch Jack Sanchez flew in for the festivities and joined the road gallery to observe “Dan” compete. Dan is no stranger to this trial, having won it in 2011 and 2013. Calico’s Touch of Class, pointer female handled by George Tracy and owned by Pete and Chris DelCollo of Pamplin, Virginia; Frank Henderson of Jetterville, Virginia and Dale Herndon of Saginaw, Michigan. “Jet” was invited to this competition in 2014. Awsum Country Girl, pointer female handled by George Tracy and co-owned by Bill and Marge Ricci of Powhatan, Virginia and Bill and Muriel Primm of Cream Ridge, New Jersey. The Riccis and Muriel were in the gallery each day, cheering “Zeva” on in her quest. Grousewoods Skeeter, English setter male handled by Matt Basilone and owned by Larry Craig of Schwenksville, Pennsylvania. Matt’s wife, Miranda rode each day for “Bud” and Cole Henry made the trip with them to scout. Max Jack’s Tot, pointer female handled by Jack Herriage and co-owned by Dr. Bob and B. J. Dow of Norman, Oklahoma and Mike and Felecia McClanahan of Lee’s Summit, Missouri. The McClanahans were on hand for the trial, Mike riding in the road gallery each day. Felecia maybe checked out some shopping sites. The Dows had a grandson who chose to make his debut surprisingly early and they couldn’t make the trip. Mighty Max is doing well, I am happy to report. Carol’s Elhew Goldie, pointer female handled by Jack Herriage and owned by Ed and Jo Beverley of Ovilla, Texas. Trusted scout, Virgil Moore made the long trip from Canyon, Texas to scout for Herriage’s dogs. Erin’s War Creek, pointer male handled by George Tracy and owned by Allen and Sandra Linder of Livingston, Tennessee. Allen and Sandra attended the trial along with their biggest supporter, granddaughter Madison McDonald. “Luke” also made a bid for this title in 2014. Cassique’s Low Rider, pointer male handled by Doug Ray and owned by Ray Pinson of Evans, Georgia. Pinson was unable to attend due to other commitments. Enhancement Southern Belle, pointer female handled by George Tracy and co-owned by Tom Hance of Prince Frederick, Maryland and Becke Blanton of Fitzpatrick, Alabama. Becke rode each day to cheer for “Annie”. Erin’s Silver Wings, pointer male handled by George Tracy and owned by Allen and Sandra Linder of Livingston, Tennessee. “Rex” had Allen and Madison in the saddle watching him. Fourteen of the United States were represented by handlers/owners of these top-notch dogs. The format of the Invitational is two days of an hour brace by each of the twelve contestants. At the end of the second day, the judges select two or more worthy dogs to run a third day for one and a half hours to decide the champion. The judges for the 2015 Invitational were well qualified magistrates. Both gentlemen are highly successful, seasoned trainers and handlers in open stakes. This writer will not note how many years they have been training dogs. Suffice it to repeat my comment, “well-qualified”. Gordon Hazelwood of Dardanelle, Arkansas and Jerry Hailey of Buffalo, Missouri looked at the 12 prominent athletes with unbiased eyes, giving their full attention to each performance. This trial is blessed to have so many sponsors and supporters. It is a very special event in the trial world and the sponsors make it even more special. First and foremost is Purina, from their excellent food product to the oil painting presented to the winner each year, to the caps and clothing provided as gifts. Many thanks to Pat Lamantia and his excellent staff. SportDOG is another sponsor who is most generous with their donations; Tri-tronics, Gun Dog Supply, Leather Brothers, Garmin, Tucker Saddlery, Haggis Saddlery, Collar Clinic, Nancy Whitehead Sport Dog Photography, Spalding Labs, Gordon and Cindy Hazelwood who contribute Montana Silversmith belt buckles each year. Other supporters who are generous in their assistance are Carol and Witt Stephens, Dr. Jeff and Melanie Hale, Farmers Association, Ginger and Don Kidd who help finance the cocktail hour each night, Connie Crowell provides the USSDI caps along with helping with kitchen duties and marshaling each and every brace of the trial along with Joyce Taylor, Mike Taylor and Marcia McNeal provide photography of activities and the remarkable cake depicting the prior year’s winner, J. D. and Jill Smith who help with grilling and serving and Jill’s beautiful Valentine cake. Les Taylor was kind enough to loan a truck for dog transportation and Steve Messick drove it each day getting the dogs to the proper place in a timely fashion. Vicky Becart assisted in the role of electronic guru. Janice Stroud of the popular Mayflower restaurant, catered lunches each day as she has been doing for 20-something years. It is always a pleasure to see her smiling face and to eat her scrumptious home-style cookin’! And then there are the kind benefactors whose continuing contributions enable this to be a most sought after title: The late Lee Cruse, Charlie and Linda Jackson, Jack, Audrey and Brian Sanchez, Randy and Lynn Potter and Johnny and Joyce Taylor. Much gratitude goes to all of the above for their munificent support. Arkansas Game and Fish Commissioner Andrew Parker stopped by for a visit on Sunday and took a brief tour of the grounds. Purina’s representative for the area, Roy Pelton and his lovely wife, Roxanne enjoyed the weekend after shopping for warmer clothing. Claudia McNamee and her charge Richfield Silver Belle were invited to this championship last year. Unfortunately, Belle became ill and had to be withdrawn. Claudia came anyway and at the end of the trial, promised she would return. Proving to be a woman of her word, return she did and graced the gallery each day. Madison McDonald discovered that she had crucial tests at school on Friday which she could not miss; therefore she would not be able to make the trip from Tennessee with her grandparents. She almost had a meltdown until grandmother Sandra Linder assured her they would “take care of it”. She flew into Little Rock late Friday night and was able to ride both days of the trial. (She aced the tests, by the way!) Frances Thompson accompanied her husband, Woody who rode in the gallery as did Johnny Van Horn, Les Rowell, Rita Ornsby, Jim and Preston Martin and John Daugherty. Mike Taylor and Marcia McNeal were in the saddle each day. Some folks crumble and crash when faced with adversity. Then there are those who step up and “figure it out”. Joyce and Johnny Taylor fit into the last class when planning the 2015 US Shooting Dog Invitational. Who knew that a horse barn could become a swanky banquet room? Complete with sparkling chandeliers, twinkle lighting, large dining tables decked out in frosty white tablecloths, accented with red vases filled with possum haw and red candles? Cozy seating arrangements and warm heaters warded off some of February’s chill. A full bar, and tasty dinners were served each night that left no one hungry. The Taylors have been doing this for 19 years but they were faced with a different set of problems after the tornado took away our clubhouse at Camp Robinson and changed the face of the grounds. After much clearing and cleaning of debris, the show was able to go on, thanks to Arkansas Game and Fish and a lot of volunteer man-hours. A thousand-plus quail were released by the Camp Robinson Conservation Association in January, which are checked and fed regularly by supportive volunteers. Most braces had multiple covey finds during the running. Friday night’s dinner was sponsored by various supporters of the trial. A meal was presented of barbecued ribs, pork and beef with many sides and desserts. Marcia McNeal brought a beautiful cake depicting the 2014 champion, Not’ta Snow Balls Chance. All handlers and owners received USSDIC caps and shirts. 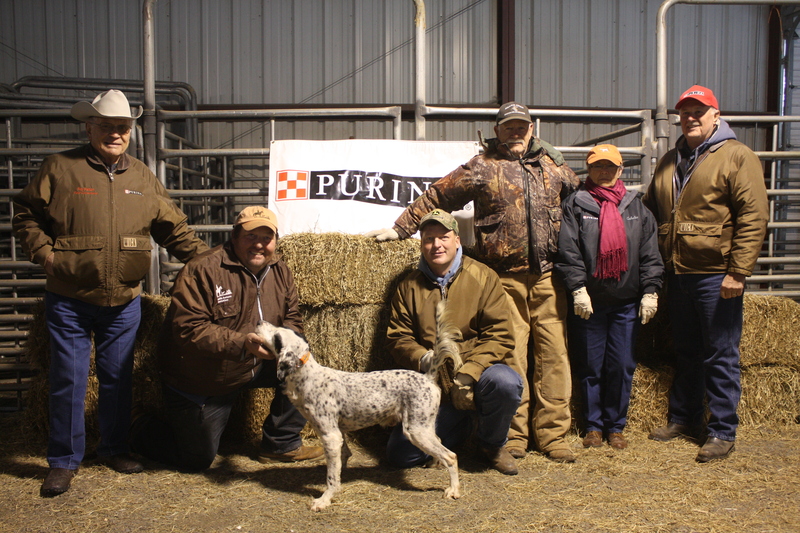 Each handler received certificates for Purina dog food and a Leather Brothers collar for each entry. Owners were given a Nancy Whitehead Sport Dog Book. Judges and reporter were given a USSDIC cap and jacket. Following the dinner and gifting, the drawing was conducted for Saturday and Sunday’s braces. 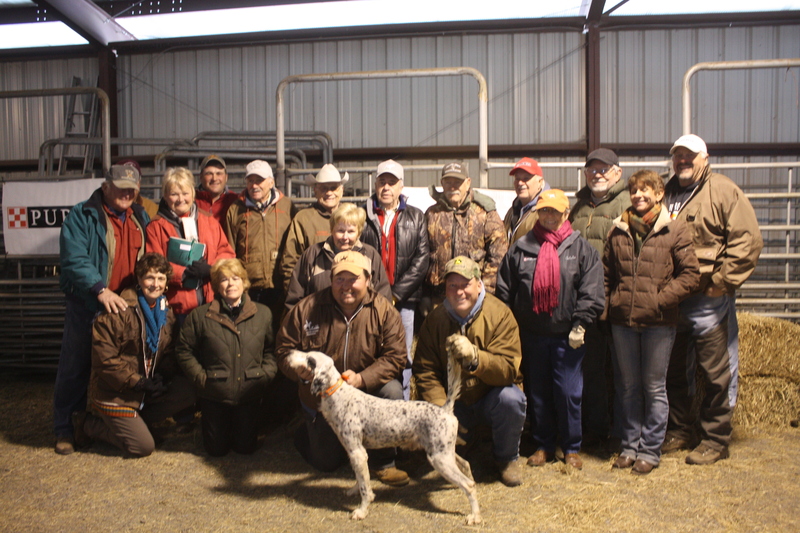 Saturday morning all handlers, owners and dogs were on the line for the annual photo shoot of all the contestants. And then it was time to get down to the nitty gritty. Everyone seemed to be excited to be there and rarin’ to go! The weather co-operated through the first day—cold but no wet stuff. Calico’s Touch of Class (G. Tracy) and Carol’s Elhew Goldie (Herriage) were away in the first brace. Jet had a good find at 6, covered the ground with a good race. Goldie ran a medium race and had no birds in the hour. Not’ta Snow Balls Chance (Perkins) ran a nice race. He had an unproductive at 38, was credited with backs at 50 and at 54. Enhancement Southern Belle (G. Tracy), a classy little female, ran the country right but came up with nothing the first half. Then she scored with nice finds at 38, at 50 and 54, all handled properly. She ran an upfront race, applied herself well. Cassique’s Low Rider (Ray) had a nonproductive at 15, then scored on game at 35. A good find. His race picked up in the second half. Awsum Country Girl (G. Tracy) backed the bracemate at 15 and was standing on point next to the fence at 20. Birds were produced, all in order. She had a good ground effort. Conecuh’s Pressure Test (Ray) was up with Erin’s Silver Wings (G. Tracy) after lunch. Pressure Test was on a mission, with good finds at 10, 15, 43 and 60. The last one was a most impressive one in a brush pile. The dog stayed out to the front during the hour. Wings was a handful on the ground and had one find at 10 in his first outing. Great River Ice (M. Tracy) ran a medium race and hunted hard for the hour. He had a stand early but handler was unable to produce birds, and he was taken on. Flight of birds was called by the scout near bi-color, then “Dan” slammed into point. Handler shot. Flight was called again, three birds were seen officially to lift behind the dog. Handler shot again. Grousewoods Skeeter (Basilone) ran a nice race but could not come up with game. He was gone at 50. Handler rounded him up after time as the rules dictate. Erin’s War Creek (G. Tracy) and Max Jack’s Tot (Herriage) was the last brace released for the day. War Creek scored early with a good find at 6. Tot had her running shoes on the first 10 minutes, then settled in. After Reed’s crossing, she made a left turn and was not seen again. She was picked up after the brace ended. Creek shortened somewhat the last 10 minutes but still hunted well with no more bird contact. Saturday night’s festivities included the cocktail hour, courtesy of the Kidds, a delectable catfish dinner sponsored by World Class Fireworks, Mike Marietta, Bill Cignetti and Mike Deplue and then MORE gifts! In honor of the day, Jill Smith furnished a Valentine cake for dessert. Rex Garner, was presented by Purina rep Roy Pelton, with a beautiful Ross Young oil painting of the dog. The valued painting was sponsored by Purina. Also going to the winning owner was a Montana Silversmith belt buckle which was kindly contributed by Cindy and Gordon Hazelwood. Handlers, owners, judges and reporter received gift certificates from Gun Dog Supply. SportDOG wax-coated caps were passed out to each handler and owner. Spalding Labs gave generous Bye Bye Odor products to each handler and owner. A SportDOG 1875 Beeper and Training System was auctioned during the evening with John “Buzz” Daugherty taking home the prized item. Erin’s War Creek (G. Tracy) and Grousewoods Skeeter (Basilone) were released at the morning breakaway. Skeeter took off and was not seen under judgment after 5 minutes. Bad luck after such a long trip to get here. War Creek, unfortunately had no birds. He had a barren stand at 33 and nothing further. Max Jack’s Tot (Herriage) had good finds at 16 and at 45 on the side of a hill. Birds were put up, everything good. Erin’s Silver Wings (G. Tracy) went into a little finger just off breakaway and was found pointing at 3. Birds were raised, all in order. He got out of pocket and tracker was requested at 55. Great River Ice (M. Tracy) suffered a nonproductive at 8 across the creek. After being released, he went about 40 yards and slammed into point at 10. A big covey was put up. He ran a nice, strong race and scored on birds at 20 and 41. All in order. Concecuh’s Pressure Test (Ray) backed the bracemate at 8 on the nonproductive and again at 20 and 41. At 12, “Jake” was credited with a stop to flush, and then had a good find at 14. He ran a good strong race on this second day of competition. Carol’s Elhew Goldie (Herriage) ran a nice race for 35 minutes. She was found standing at 56 but handler could not produce game and she was taken up. Calico’s Touch of Class (G. Tracy) also did a good job on the ground but was gone at 45. Neither dog had bird work. Cassique’s Low Rider (Ray) had a better race and applied himself better this second day. He had an unproductive at 30 and good finds at 40 and 50. He was leashed at 50. Enhancement Southern Belle (G. Tracy) ran a good ground race, after a rather slow start. She had a nonproductive at 15 and backed Rider at 30 and 40. Not’ta Snow Balls Chance (Perkins) and Awsum Country Girl (G. Tracy) shared a find at 18 minutes. Snow Ball reached out more on this day, had some absences in the last half. Coming back toward camp, Country Girl was found standing at 30. Handler kicked up birds, all in order. A nice piece of work and she ran a good ground race with a strong finish. Everyone congregated Sunday evening for the soiree and the announcement of the judges’ decision for callback dogs. The evening meal was hosted by Rex Garner in honor of his 2014 US Shooting Dog Invitational Champion, Not’ta Snow Balls Chance. Steaks done to a turn with Johnny and Mike Taylor and J. D. Smith serving as grill masters; baked potatoes, salad, hot rolls and desserts rounded out the tasty meal. Prizes given to the handlers included SportDOG training and no-bark collars, a Haggis saddle bag, SportDog bag and a repair certificate from Collar Clinic. Owners received a beautiful invitational pen, personalized with their dog’s name. Handlers and owners received a Tucker Saddlery bridle and breast strap, Leathers Brothers roading leads and lanyards. Judges and reporter received Purina vests. The ladies in the group were given collectible stuffed California quail. The awaited announcement of the callback dogs was declared by Taylor. Conecuh’s Pressure Test and Awsum Country Girl would run first thing Monday morning with three dogs on standby, to-wit: Not’ta Snow Balls Chance, Great River Ice and Enhancement Southern Belle. Mother Nature hadn’t spoken yet but she was heard from, you can be sure. Freezing rain/sleet began Sunday night and by morning the ground was entirely covered. And by all weather reports, it wasn’t over yet. The officials discussed the situation and chose not to jeopardize the safety of man, dog or horse under those circumstances. The callback was precluded and Conecuh’s Pressure Test was declared the winner of the 2015 Invitational. A convincing winner in his two days’ performance. Multiple finds each day and a strong, front-running ground race, never letting down. Handler Doug Ray received a $7500 purse, an Astro Garmin unit, Pro 500 Tri-tronics training collar and 12 bags of Purina dog food. The Gibsons will receive a Ross Young oil painting of “Jake” and a beautiful Montana Silversmith engraved belt buckle. And a good time was had by all, especially Conecuh’s Pressure Test! For more photos of the 2015 Invitational Championship please see the 2015 dropdown tap under “Photo Gallery” on the Home Page.